The Queen of Seaford: Where Did The Time Go? Three short years ago we decided to have one final Fourth of July in Virginia. Our habit was to go up to the Yorktown Battlefield, listen to the Air Force band and then watch the fireworks. Three years ago! Hard to imagine. While trying to organize photos for this post I went back through prior posts and lots of photos. To see the 2010 and 2011 click on 2011, and for last year's post click here. We have had a lot of rain this spring and early summer. Most plants are happy though many haven't bloomed like they did last year. Here is the front garden. My Cercis canadensis 'Ruby Falls' is quite happy. Last fall I moved about half of the Creeping Phlox to the backyard garden. It looks ok in the spring and then just a space filler for the rest of the year. Am a big fan of burgundy leafed plants, so in addition to the 'Ruby Falls' I have two Loropetalum 'Purple Pixie' - one in the ground and one in the container. Both are courtesy of Southern Living Plants and last year's Spring Fling. (thanks Debbie Teashon for sharing the one with me). Another burgundy leaf plant is Loropetalum 'Daruma', under the bay window. The plants in the foreground are Delosperma-- a couple different varieties. I am not impressed with their lack of flowers this year. There were some early on in the spring...but not many lately. May try something else next year. The different between 2012 and 2013 from the front door shows how full the grasses have become. The Magnolia grandiflora 'Little Gem' has grown a good bit, using the roofline of the shed as a guide makes it easy. The backyard last year seems to be blooming a bit more, we have had so much rain this year that blooms are few and far between. This photo below is looking left. This is looking more to the right/center of the backyard. There are a lot of Echinacea purpurea, Purple Coneflowers blooming. This year I used a panoramic shot, lots of Monarda blooming but only one lone Coneflower, though there are a lot of seedlings from last year. Be sure to click on the photos to make them larger so you can see the details better. Looking back up to the house you can see the Elephant Ears in a happy spot, big and lush. The above and below are the same view, grasses and shrubs are a bit larger (so are the weeds). The photo below is the side yard, I had added a variegated Hydrangea to the mix. This bed has Deutzia gracilis 'Nikko' and Abelia (I think it is Abelia x 'Edward Goucher' but not sure) are also in this bed. I wasn't happy with this bed, so this past winter I moved the Abelias to a new spot along the woods and brought the tiny Camellias out of the shady garden. Think this is a better spot for them, they sure have grown since moving them. The Acorus got pruned back this spring as it was looking ratty. I did it to these first, trying to see how they fared to the pruning. Next year late winter I will do the ones by the front door since these responded so well. See how much they filled in? The older foliage isn't looking nice so a good haircut will help for next year. Looking up along the driveway the grasses and Crape Myrtles are continuing to be happy. You can see in the photo below that the Artemisia 'Powis Castle' isn't doing well. I should cut it back again. This rain has made it soggy looking. The Miscanthus 'Little Zebra' hasn't put up flower stalks yet this year....really strange growing season. Last year looking from the other direction, the Lantana camara 'Miss Huff' is in full bloom. You can see how large the Lantana are this year, but very few flowers. The Fringe tree, Chionanthus retusus bloomed this year, last it didn't, and has grown an amazing amount. This is the newest addition to the family garden. Hemerocallis 'Alexander's Ragtime Band' for our son in law Alex. The Peony next to it is Rachel, a red peony. This is a side view on the lower side of the house, with the family garden at the corner. Hydrangeas were moved to this location from the shady garden and seem happier. Also in this mix are Viburnum tinus 'Spring Bouquet' and Callicarpa dichotoma 'Issai' and multiple varieties of daylilies. When I said lower side of the house you might have wondered why......we do have a slope. Also on the lower side along the property line are a variety of shrubs. I can't wait for these plants to mature, there are a couple blue cypress and a few yellow foliage shrubs and one Loropetalum 'Ever Red'. When and if anyone ever builds next to us we will have a nice screening with this mixed border. A new planting area is the left side of the driveway heading up to the street. See the two dark spots in the pinestraw? I emptied my compost bin to those two places. This winter I will get a couple bareroot Oakleaf Hydrangeas. They will have plenty of room to grow to their full potential. I will close with a close up of my little friend. If you look at this year's photo view looking out the front door, there is something on the sidewalk. This is one of our many Anoles. Thanks for coming along for a yearly update. 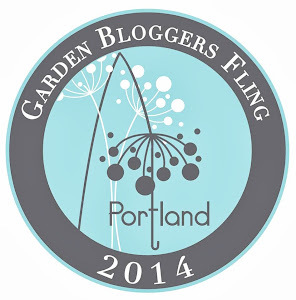 Have you marked yearly progress in your garden? I marvel at the changes when you place pictures side by side. 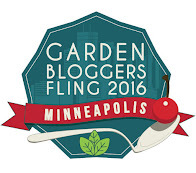 Having just returned from the Garden Blogger's Spring Fling I have lots and lots of photos --be ready! ©Copyright 2013 Janet. All rights reserved. Content created by Janet for The Queen of Seaford. words and photos by Janet,The Queen of Seaford. Your garden has grown a lot! The Edgeworthia is huge! I enjoyed the tour and see your garden from all angles. We have a similar slope in our front yard. I will be replanting the entire bed this fall. It is a challenging space. Karin, you will have to come and see it in person. I will be redoing a lot of mulch and replanting some drought tolerant plants that couldn't handle the rainfall amounts we have had. How lovely! I especially like crape myrtles and Echinaceas. The grass really has filled in from 2012 to 2013. Thanks for sharing these pictures! Judith, thanks for stopping by. I was really surprised at the grasses, they do fill in quickly. Amazing how quickly your garden has matured. I like how you've used a mix for that screening border. Everything looks great and I'm sure you and your family are enjoying the serenity of your garden on the lake. Freda, It has matured a good bit but there are still so many stalled plants with all this rain. The mixed border will be nice once it gets a bit larger. Britta, I do have a lot of gardening space, trying to fill it in! Thanks for your kind words. The rain is driving me nuts but it is a boon for young gardens. Yours looks great! Marian, the rain has really stalled/stunted many of my plants. Seems like they are in a holding pattern. Yes, it is driving me nuts too! Comparison photos are so heartening, especially when we become impatient with our progress. I am always amazed when I look back at photos of our place when we first moved here. Ricki, I like seeing the changes, sometimes there doesn't seem to be much growth until you see the photos. Oh I love those long vistas of your beautiful grounds and gardens. And it is growing in so nicely Janet. We have tropical weather and everything is growing...well almost everything....especially the weeds. Donna@GEV, Thanks, I love coming into the dock after being out on the boat.....seeing the garden from the water is great. My weeds are growing quite well too! What at an absolutely lovely garden and setting! It was so wonderful to meet you at last too. I loved our conversations. Linda, thanks so much. It was lots of fun meeting you as well. If you are ever in SC, please come by! Everything looks great! Your plants must be happy under your care to have grown so much! Love that you planted a magnolia. They're one of my favorite trees. Sometimes I don't realize how much my garden has grown and changed until I look back at old photos. They help me keep everything in perspective when I get frustrated. Tammy, thanks. Some have grown nicely, others have been replaced! I have three magnolias in the backyard and one in the front, love it when they are in bloom. Oh, I miss the anoles! We had them in Mobile, but there is no equivalent here. Your yard is looking gorgeous! So lush - your photos got me a little nostalgic. Here we are entering the hot, dry part of summer and things are rapidly turning brown. At least we had reasonable rain this spring. Cynthia, I love the anoles, they make me smile. I know my landscape is quite different from yours, hope your summer hasn't been too dry. I am sure this was a rewarding exercise Janet. It is always fun to see the fruits of ones labours evolve and change with time. I am rather sorry not to have taken such documentary photos to mark my garden's progress. Jennifer, it is good to compare yearly photos to see how and if things have grown. As for your garden, no time like the present! What a great job you've done photographing your progress. I find I forget what viewpoint I've taken a photo from so my photos year to year are always a bit off. Your garden is progressing so nicely and it's great to see the growth from year to year. Marguerite, thanks! I take so many pictures, think there was one day in June I didn't take a picture of the garden. I do like seeing the changes from one year to the next. I love the view from the pier. Each year your garden not only grows but seems to fit the landscape. Just beautiful. Gene, thanks, I am fond of this view as well. I hope it fits the landscape as I am trying to have it be a mature garden without a ton of work. All I can say is "Wow," Janet! I remember when you first moved here and began showing photos of the beginnings of your garden. It certainly has filled in and grown beautiful in such a short time. Those Edgeworthia are amazing! 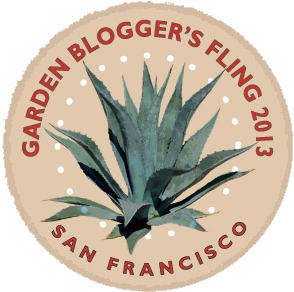 Looking forward to your posts on the SF Fling--I've only seen some pictures on Facebook, but you must have seen some fantastic gardens. Rose, I was looking back at pictures of when we were building, boy that is a change! 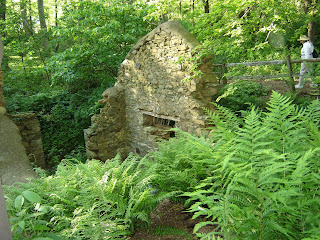 As for the Fling, we did see some really remarkable gardens. What a lovely lakeside setting you've created! It's so useful to have a photographic history of your garden-especially when comtemplating changes. I use alot of annuals and non hardy tropical plants both in containers and in the ground so the garden can change drastically from year to year. Sue, thanks so much. It has been very helpful to chart the progress over these years. I use a few containers, but they dry out so much (I am rotten at watering containers). Thanks for the update. So many changes - almost all of them good! Aaron, I am not sure if you are in a zone that can handle Edgeworthia, but if so....get one!! It's looking so good Janet! I love those long shots and the description. Your landscape is really nice! Three years-where has the time gone/??? Tina, thanks! I like long shots until I see all the weeds! ;-) I am happy with the growth of the gardens....very rewarding. I don't know where the time has gone! I never saw such wide shots of your property. Wow, it is big and so beautiful. Looking from the dock back is such a great view. I remember you planting along the way too. How time flies... Love your little friend too. I want anoles, they look friendly. Donna@GWGT, thanks! We have an acre with 4 acres to the left (as you look at the lake) and 6 acres to the right we don't own, but no one has built on them.....so we feel like we are in our own little kingdom.